Please enter your email below and we will send you an email to reset your password. Girl Meets Dress is the leading luxury dress hire UK destination, for all life's special occasions. Wouldn't it be amazing if you could wear a different designer dress for every special event in your calendar? Hire designer dresses from your favourite designers and accessories at up to 95% off their original retail price. Rent a dress from over 4,000 designer pieces from over 200 designer dresses to hire including Self Portrait, Stella McCartney, Suzannah dresses and more. You can visit our showroom, or we will deliver the dresses to your home, your office or hotel. Have fun and send it back to us after the event. It's like we're your new best friend with the massive designer wardrobe who is cool enough to let you borrow whatever you want! BROWSE Find the designer dress hire of your dreams by browsing your event type, dress size or favourite colour. Does Girl Meets Dress have a shop to visit? Option 2: If your event is more than 30 days away from the date you order you can opt to use our ADVANCE TRY ON service. You will receive the dresses asap and choose one to have re-delivered for the event. This service is £30 per order (non refundable) and you can tick this option at the checkout. Standard delivery for dress rental uk within the United Kingdom is £9.95. This is for delivery and return all included. Same Day delivery within central London is £20. We accept Visa, Master Card, Delta and Switch credit/debit cards and Bitcoin. How do I return my dress rental uk? The girls at GMD know that not all of us can afford to wear a £1000 designer frock every weekend and we understand if you are feeling nervous about how the dress will fit. Not to worry! Our fashion-savvy customer service team will ensure you find a perfect dress rental uk that will fit like a glove and will make you look Cannes-Film-Festival-worthy as they know how all our dresses feel, fit, and have suggestions on how to accessorize. Part of our service is providing you with the best dress rental uk experience possible so feel free to contact the Girl Meets Dress team with any questions you might have. We just love this Floral print and colour combination. The Jenna dress features a high neckline with back fastening and pin-tuck detail on the front and back bodice and the voluminous sleeves. There’s a slight flare to the skirt offering movement in the dress, and an invisible side zip for an ultra-flattering fit. This GHOST The perfect dress hire UK for any smart occasion. Rent a dress, Designer dress hire. Need more advice or dress suggestions?
. 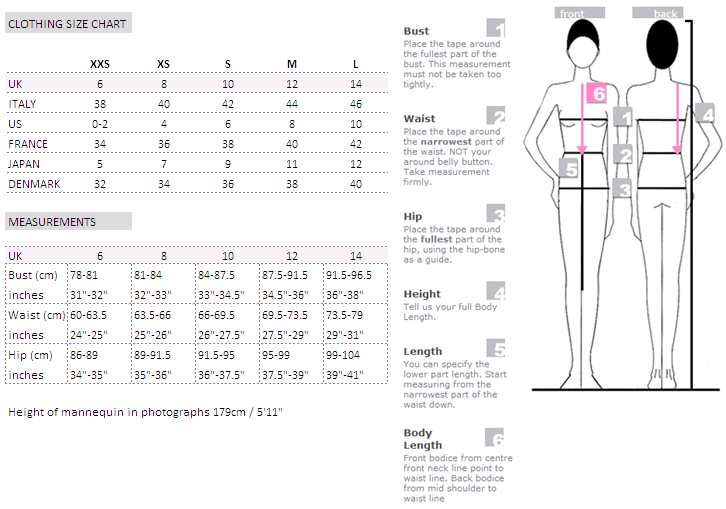 Height of model is 178cm/5'8" and wears a size UK 8.